The apartment is very spacious as the one I booked has t bathrooms which makes it quite convenient for a group of 4 people. Hotel surrounding is very rainforest like, lots of trees and one morning I woke up by the singing bird. Hotel also helped me book the private pickup from/to airport and port Douglas where we took the Daintree day tour before our arrival. Great location!!! Quiet, but easy walk to beach, shops and Restaurants of Palm Cove. Roomy, clean 2 bedroom condo with full kitchen, dining and living area. Perfect setup for a family vacation! The staff at reception were very friendly and helpful. Also, the apartment was very well laid out and well equipped. No noise issues from other residents. The comfy beds made for a great sleep and the gardens are beautiful. Plus the pool was lovely. Fantastic pool and spacious comfortable apartments. Perfect for families, particularly will small kids. The apt was lovely and spacious, a short walk from several good restaurants. Managers were friendly snd accomodating. Adrian went out of his way to allow some flexibility during our stay. From helpful advice to additional rooms and the apartment was simply stunning. Great for families. Tennis court and swimming pool. Clean private grounds. Very clean apartment. Fantastic pool and bbq area. Friendly staff. Great value for money! 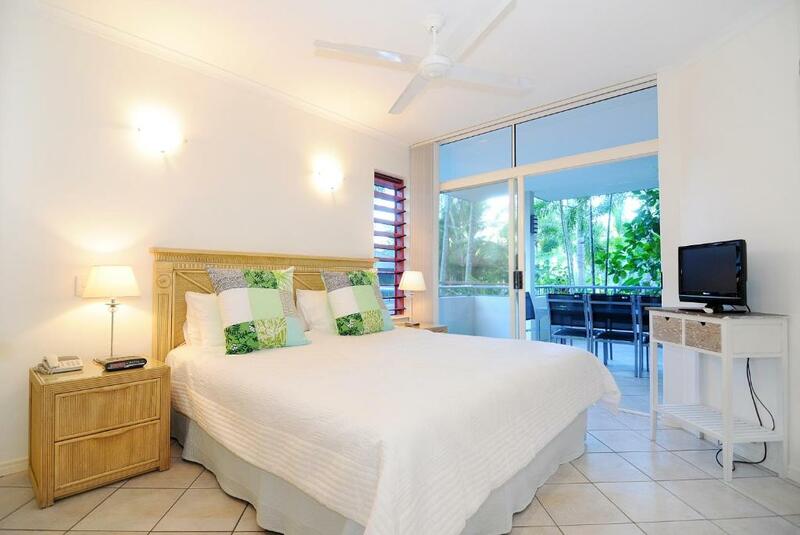 Lock in a great price for Oasis at Palm Cove – rated 9 by recent guests! Oasis at Palm Cove This rating is a reflection of how the property compares to the industry standard when it comes to price, facilities and services available. It's based on a self-evaluation by the property. Use this rating to help choose your stay! One of our top picks in Palm Cove.This 4-star hotel is adjacent to the Great Barrier Reef, next to restaurants, shops and galleries. It is a 2-minute walk to the Palm Cove Esplanade and a 10-minute drive to the Skyrail Rainforest Cableway. Free parking and free WiFi are provided. The apartments at Oasis Palm Cove have island-style décor and feature a full kitchen and lounge/dining areas with front and rear balconies. Guests at the Oasis Palm can enjoy its lagoon-style pool and spa. The hotel also has a BBQ area and full-size tennis court. It is a 20-minute drive from Cairns International Airport. Guests receive discounts for tours and restaurants when staying at the Oasis at Palm Cove. 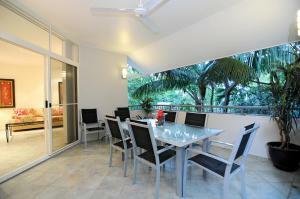 뀐 Located in the top-rated area in Palm Cove, this property has an excellent location score of 9.2! When would you like to stay at Oasis at Palm Cove? This apartment features a private balcony with garden views. It includes laundry facilities, a master bedroom with a walk-in wardrobe and a kitchen with a microwave and refrigerator. This apartment features 2 private balconies, laundry facilities and a kitchen with a microwave and refrigerator. This spacious apartment features a balcony. 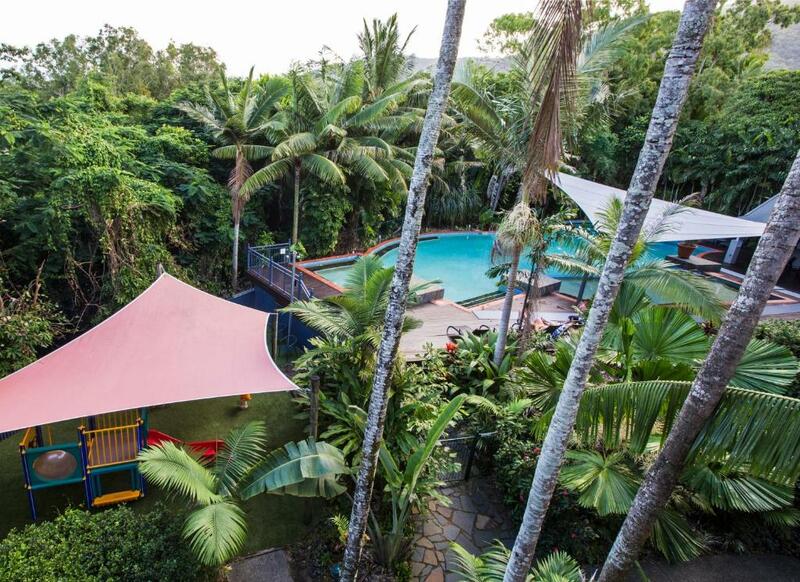 Oasis at Palm Cove apartments offer you the best of both worlds: an excellent location in an exclusive cul-de-sac just a genuine 200 metre walk to Palm Cove beach and village, and a quiet and private sanctuary to really relax and embrace your total holiday experience. These extra spacious 1, 2 and 3 bedroom apartments are fully self-contained, superbly maintained and designed for maximum privacy. The 36 apartments, which are extremely comfortable and classically stylish, are set among beautiful, established tropical gardens covering nearly three acres. At the centre is a very large and lovely lagoon pool with wide timber decks, a gazebo, a children’s playground and a wading pool. Cook a BBQ poolside, or whisk up a gourmet meal in the well appointed apartment kitchen to enjoy on your private balcony! There’s free Wi-Fi, a superb honeymoon suite, rental car hire, plus a free tour booking service which offers advice to help with planning your trips to the Great Barrier Reef, The Daintree Rainforest, Kuranda and much, much more. We also have free food and beverage discount cards available to our guests. Sunrise at Palm Cove is magical. Many good restaurants to choose from from all budgets. House Rules Oasis at Palm Cove takes special requests – add in the next step! Oasis at Palm Cove accepts these cards and reserves the right to temporarily hold an amount prior to arrival. Please note that this hotel does not accept payments with American Express credit cards. Please note that the reception closes at 18:00 from Monday to Saturday, and at 12:00 on Sundays. If you expect to arrive outside reception opening hours, please inform Oasis at Palm Cove in advance, using the contact details found on the booking confirmation. Please inform Oasis at Palm Cove of your expected arrival time in advance. You can use the Special Requests box when booking, or contact the property directly using the contact details in your confirmation. The beds were comfy, however the pillows were very hard. The friendliness ,helpfulness and welcoming by the owners Adrian and Elmira. Adrian was so accomodating and helpful, arranging a high chair for our toddler. He also helped us with organising day trips and suggesting good things in the area to try. Such a short stroll to the beautiful beach and restaurants. Oasis is true to its name with gorgeous gardens and pool. Our apartment was big with large balcony and open plan living. Highly recommend staying here! We hope to come back one day soon. Thank you Adrian for taking such good care of us and driving us to Cairns to get us to our hire car! Beds were very hard, mainly the second bedroom. All the plates in the cupboards were dirty. Location is great, good value for money, staff friendly and helpful. Property facilities were fantastic! BBQ and pool area was very accommodating and made relaxing by the pool and enjoying a meal very easy. Makes a holiday with kids very simple. Undercover parking was great, helped a lot when it was raining. The owners were only to happy to help and their hospitality was 10/10. Our room was of generous size and again had everything we needed to make us all comfortable and relaxed for a family week away. The layout of the unit. Lovely couple run the business. Very friendly and helpful. Beautiful property, was like our own resort as you barely saw other families. Beautiful pool which was fantastic for our kids as well as us parents. We stayed 7 nights and nobody popped round with some fresh towels or loo paper. I didn't really mind as I laundered some myself / went to Coles but two fresh towels and a couple of loo rolls delivered midweek would have been nice. The managers Adrian and Elmira were friendly and accommodating. The facilities are clean and well maintained. Gardens are lovely. The location is perfect. 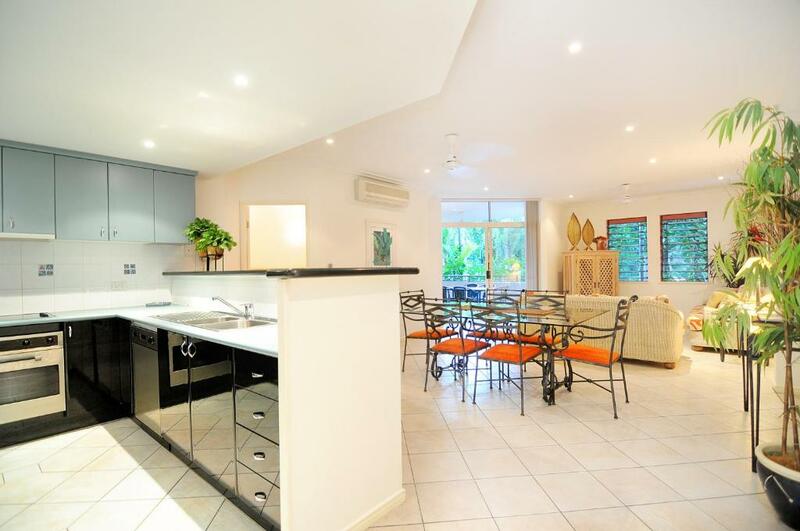 Close to Palm Cove shopping and restaurants, close to beach, easy access to highway. We had an evening flight and they let us have a late check out and hang out in the pool area for the afternoon. Very kind. Would definitely come back. Nice spacious apartment, close to the beach. Very quiet and kids friendly. Amazing pool. Great tennis facility. We loved the feeling of being in a Rainforest. And the management team was friendly and extremely helpful. Thank you Adrian and Elmira for the unforgettable holiday we had.